Underpronation, also known as supination, is a foot-positioning problem encountered by runners and other athletes who run during their sport. However, according to a 2011 article from Mark Charrette published in Dynamic Chiropractic, “High-arched feet, referred to as excessively supinated feet, are not nearly as common as overpronated feet.” Though it's a defect that affects a relatively small amount of runners, it's important to understand the causes, the diagnosis and how to treat it properly so that you can more safely and efficiently. Both pronation and supination are issues signified by the way your foot hits the ground as you are running or walking. But while pronation involves and inward roll of your foot and ankle, supination is the outward rolling of your foot and ankle. In a pronated foot, the inside part of your foot and the arch absorb most of your weight as you land. A supinated foot, on the other hand, means that the outer edge (pinky-toe side) bears the majority of your weight. Neither foot position is healthy for your feet or ankles, as both can cause serious pain and injuries. It's important to decipher which of these factors are contributing in order to treat the root of the problem. Gray says internal causes can include rigid joints, alignment problems in the heel or the ball of the foot or strength and flexibility imbalance in the ankle. When you naturally underpronate, the muscles and joints in your feet are working to try to correct the imbalance. This can lead to issues in other joints like your knee and hip and even injuries. On the other hand, external causes may include unstable or worn-out footwear or running on uneven surfaces. Other issues from overcompensation include stress fractures, which is the most serious effect of underpronation, according to Gray. 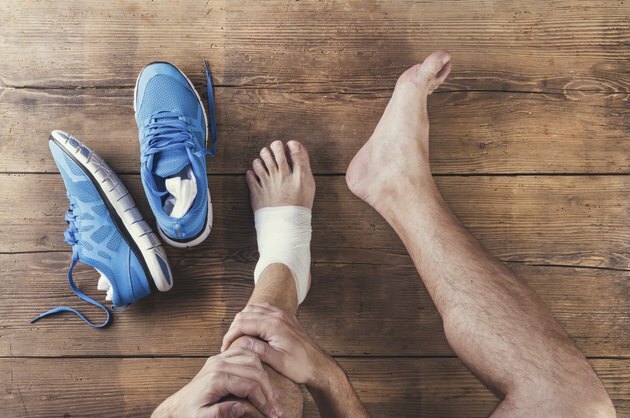 “Other effects include high risk for overuse injuries, such as tendonitis and muscle strains,” he says. Since it's hard to see how your foot lands as you run (you should be looking ahead, after all), you may want to find a professional to help analyze your gait and let you know if you underpronate. However, there are other ways to tell if your feet tend to position themselves this way. When consulting a professional, such as a physical therapist, running coach or trained running store employee, it's helpful to bring in an old pair of running shoes. In addition to looking at the wear on the bottom of your shoes, they'll use their gait-assessment skills to watch you walk or run and determine if you're under or overpronating. The steps you should take to correct underpronation depend upon the severity and causes of the defect. It might be as easy as changing to a new pair of shoes, should your underpronation come from external causes. However, if caused internally, it's much harder to correct. “[If caused internally] it's typically difficult or not possible to change underpronation,” says Gray. “[This is because it's] based on your bone structure, muscle-firing patterns or running/walking stride.” Should it be due to your stride, you can work with a running coach to not only improve your stride but to get exercises that can help improve your running form. These might include ankle, calf, hamstring and quad stretches or inner thigh and calf exercises to strengthen the surrounding muscles. Are you a runner? Have you ever gotten a gait analysis? Do you pronate or supinate while running or walking? What steps have you taken to correct your gait? Did you know some of these facts about underpronation? Were any surprising to you? Share your thoughts and questions in the comments section below.